This week I start a new job! Since my most recent self has been the most "fashion conscious" self so far, the question "What am I going to wear on my first day?!" came to mind the moment after I accepted the job. Today's Simple Pleasure of the Day is the art of picking the "first day" outfit. I may have gathered most of these items before today, but I'm cementing the feeling in the now by placing them all together the night before. The cardigan is from ModCloth.com (this is the actual cardigan which I plan to review later), the tank from H&M, and the pants from Forever 21. For those who know me best, 99.9% of my clothes come from thrift stores, so I obviously had to go "fancy" for this day. The cardigan I purchased just for this occasion reminds me of the red coat outfits the British wore in the military or whatever which is kinda neat. I don't remember when I got the other pieces (or if they were gifts or my purchases), but they're still "fancy yet casual/comfy" enough for a semi-casual office I'll be strolling in tomorrow morning. 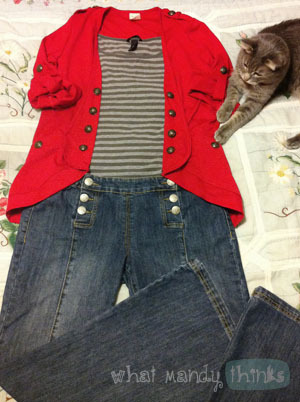 Jimmy approves of my first day outfit. - Imagining how awesome you'll look on your first day can help with nerves in case you've got first-day jitters. - I splurged with purchasing the cardigan specifically for my first day once I knew it would happen. Getting something special for yourself every once in a while rewards you for your accomplishments, and in my case I NAILED that interview yes I did! - With an outfit ready for you in the morning, there's time saved to eat an extra long breakfast or try a different hairdo that you wouldn't have done otherwise because you were too busy wondering what to wear. As you can see in the photo, Jimmy shows his approval of my first day outfit by taking notice at all the awesome buttons it has. This shot was a millisecond before he pounced all over it and almost took a button with him.